Frederick Charles Audley was born at Kingston on 13 April 1888. He was the eldest of four children born to Henry James Audley and Alice Goodchild Audley nee Dorey. Frederick married Kate Chapman (1885-1951) on 13 January 1912. Kate was born at Lydlinch to William Chapman and Mary Jane Chapman nee Ryall. Owen attended Kingston School and appeared in the 1922 school photo. 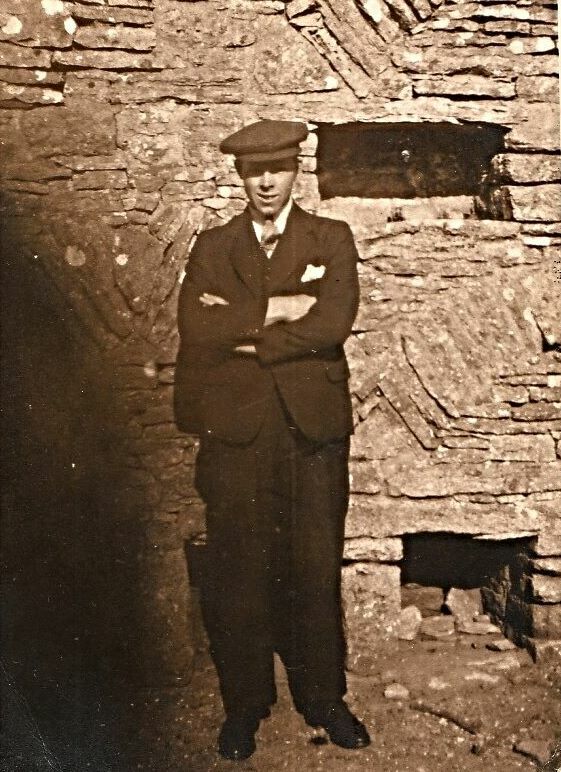 In September 1939, Owen was recorded as a builders labourer and married living at Ashley, near Romsey, Hampshire, with wife Lily R Audley and five children. Owen and Lily, whose maiden surname was Heathman, had ten children but five are understood to have died shortly after birth. Owen married Olga Doreen Dawson (1923-1994) in 1943 and they had one son. Owen was living at 96 Lincoln Gardens, Scunthorpe when he died in 1980. ‘Lynch Farm – on the lower slope of Kingston Hill … was the dairy for Corfe Castle until the mid-20th century. 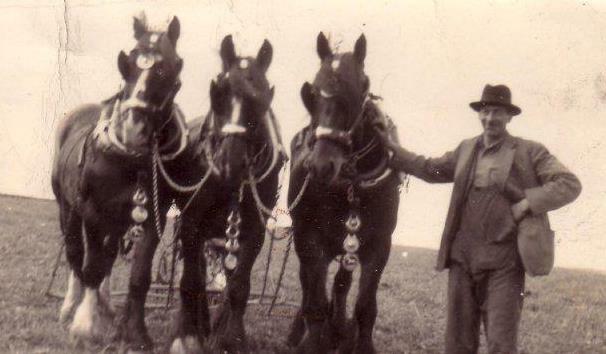 Fred Audley and his mare, Topsey, used to bring unpasteurised milk in an open cart daily to Corfe village, into the 1950s’. Fred and Topsey were in the opening scene of the 1949 film, ‘Man On The Run’, which was shot in Corfe Castle. Gertrude was born on 20 February 1918. She attended Kingston School and is pictured in the 1922 school photo. In September 1939, she was working as a waitress at the restaurant at 14 Institute Road, Swanage and she shared the accommodation above with the restaurant proprietress and other restaurant staff. On 23 December 1939, Gertie married blacksmith Arthur William John Corben at Kingston and they moved to Malvern, Worcestershire where they had two sons, Arthur T Corben, who married and emigrated to the United States, and Richard Corben, who married and now lives in Worcester. Arthur senior died in 1963 and Gertie died in 2008. Evelyn was born at Scoles Farm on 3 December 1920. In September 1939, Evelyn was a shop assistant living with the Bennett family at 43a Station Road, Swanage. She married Wiltshire-born Arthur Graham Robinson in 1942 and they had one daughter Pauline G Robinson. The family lived in Wilton. Evelyn died in 1979 and Arthur died in 1992. Doug was born at Scoles Farm on 23 March 1925. In 1939, aged just 14, he was working as a dairyman for his father at Scoles. Doug did not marry and died in 2002. Made only five foot seven to the top of his head. But was pulled back to farm life, as it was meant to be. But his strength and his will to live kept our family elated. Always there for anybody in strife. Our Dad is special, what a man! How do I know? Because you all will tell me so. Henry James Audley was born at Corfe Castle on 4 July 1865. He was the seventh child of Thomas John Audley and Sarah Audley nee Keats. He was baptised on 24 September 1865. Henry married Alice Goodchild Dorey at Kingston on 28 June 1888. Henry was then a labourer living at the Brickyard at Lynch. He could not write. Alice was the daughter of John Dorey and Anne Dorey nee Goodchild. In 1881, Alice was in service at Winkton near Christchurch. Henry and Alice had four children (see later). In 1891, Henry and Alice were staying with Alice’s widowed father John Dorey and sister at Kingston. Henry was now a shepherd and their first two children had been born. At the time of the 1901 census Alice and all four children were living at The Lane but Henry was absent visiting the Damen family at Slepe near Organford. By 1911 Henry had learned to write as he completed the census return. Their eldest child and youngest child were living at home. In September 1939, Henry and Alice were still living in The Lane. Henry, then aged 74 was a ‘general farm labourer’. Sometime after his retirement, on a slow walk up Kingston Hill when returning from a visit to the Doctor’s surgery at Corfe, Henry recounted to a companion how, in his early days, he and his sheepdog Bright were driving the sheep down Kingston Hill when they started turning and going back up the hill – when Henry got to the top he found Lord Eldon and his servants had come out of church and were surrounded by the sheep! Alice died in May 1951 aged 87 and Henry died in October 1952 aged 88. Frederick was born at Kingston. He married Kate Chapman (1885-1951) on 13 January 1912. They lived at Scoles Farm. Fred and Kate had six children. On 29 September 1939, the family were living at Croydon and Dennis was serving as a Constable for the Metropolitan Police. Ellen died in 1972 and Dennis died in 1980. Olive was born at Kingston on 14 October 1899. She started at Kingston School on her third birthday. She was confirmed at Langton Matravers aged 14 on 24 March 1914. Olive married Leonard John Light (1898-1967). Thomas John Audley was baptised at Corfe Castle on 16 May 1824. He was the son of labourer Thomas Audley (1805-1880) and Mary Ann Audley nee White (1801-1880). By 1841, Thomas was a shoemaker’s apprentice living with his family at Market Place, Corfe Castle. On 29 July 1845, Thomas, then aged 21 and a cordwainer (shoemaker), married 19 year old Sarah Keats (1825-1873) at Corfe Castle. Sarah was baptised at Corfe Castle on 28 November 1825 and was the eldest child of James Keats (1804-1851) and Harriet Keats nee Day (1809-1879). In 1841, Sarah was a servant of Corfe Castle baker and grocer John Shitler in West Street. Thomas and Sarah had ten children – five sons and five daughters (see below). In 1851, Thomas & Sarah, along with their second daughter, were living at East Street, Corfe Castle. In 1861, the family was still at East Street, with wife Sarah shown as a laundress, and with two sons present but two daughters absent. Ten years later they were back in Market Place with four sons and one daughter present. On 5 August 1884, Thomas (senior) was ordered at the County Petty Sessions at Wareham to send his child to school – this would have been Thomas (junior) then aged 12. Sadly by 1891 Thomas (senior) was in the Union Workhouse at Wareham and he died there five years later in June 1895. He was buried at Corfe Castle. Gamekeeper Thomas married Susan Hooper (1873-1967) at Sidcup in Kent on 5 March 1901 – Susan was the sister of Mont Hooper – Thomas and Susan had a son Ralph Clifford Audley (1902-1978) who lived in Flintshire and was a groundsman. Ralph married Isabella Roberts and they had a daughter Jean who is married and living in Droitwich. The amount of the March offertory made on behalf of the Bishop of Salisbury’s Fund under the new organisation of Church Finance amounted to £2 10s. 0d. The Easter offering is always and everywhere regarded as a present from the Congregation to their Minister, so that if the latter be poor, those amongst whom he labours may contribute to his earthly needs; while if he already have enough, he may devote the offering to some objectwhich he has at heart. This year I propose to send what you of your generosity give me (on Easter Day) to help to build a Church for the use of the soldiers at Bulford, near Salisbury, who though five times as many as we are in Kingston have no place of worship, while we have two. There will be no Communion Service on the first Sunday of the month (April 5th), as there will be two on the following Sunday (Easter Day). As the children’s “Mercy Sunday” falls on Easter Day, it will be kept on the Sunday following. Good Friday – Morning Service with sermon at 11. Children’s Service (in new Church) at 2.45. ; Service of Song at 6.30. Easter Day – Holy Communion at 8; Choral Communion at 11. N.B. – Will those who cannot make it convenient to remain for the entire service, kindly leave the Church during the singing of the collection hymn. Children’s Service at 3. N.B. – Will those children who bring primroses or other flowers for the decoration of their Church please take them up to the Old Church by 10 o’clock.